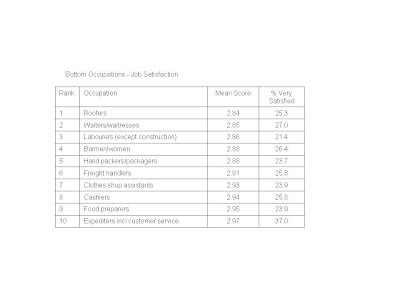 Which careers provide the least job satisfaction? The survey results reveal that the least happy and least satisfied are those people doing unskilled manual or service jobs, including customer service assistants and people who handle complaints. Research suggests that job satisfaction and well-being are less to do with salary or status of a job, and more to do with how much control you have over the job you do. Even though the amount of stress you experience tends to increase as you rise through the ranks, so too does your autonomy, and is it this, or the lack of it, which affects your sense of well-being and satisfaction. What’s interesting is that even the lowest scores aren’t really that bad…. If you have any further thoughts or comments on these survey results, we’d love to hear them. Hi Bridget – thanks for rooting out this information. 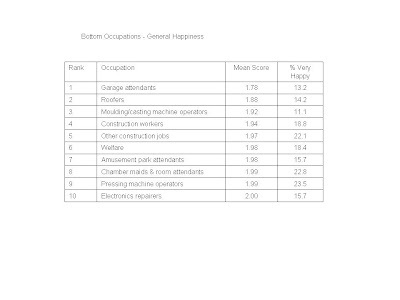 It isn’t surprising that it’s people with least autonomy in their jobs who are unhappy. Customer complaints staff must have the worst job, having to deal with irate people all the time!